Wouldn’t it be nice to have a profit calculator so you could know exactly how much money you would make from adding a sports package like NFL Sunday Ticket or NBA League Pass to your DIRECTV® service? NFL Sunday Ticket, ESPN Game Plan, NBA League Pass, NHL Center Ice, MLB Extra Innings and ESPN Full Court on DIRECTV can make you the home of your customers favorite teams by providing every game they want to see every day. We know that sports on DIRECTV are one of the biggest attractors of new customers for bars and restaurants. And we know from asking DIRECTV customers that 81% of bars and restaurants say they have seen an increase in traffic from adding NFL Sunday Ticket, ESPN Game Plan, NBA League and other sports packages on DIRECTV. The question is, How Much Profit? 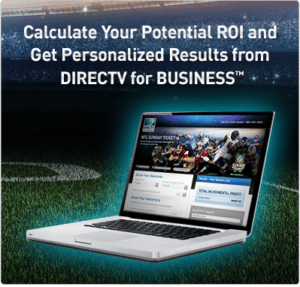 DIRECTV has made understanding just how much profit you can make from NFL Sunday Ticket and other sports packages easier by creating profit calculators for each package. 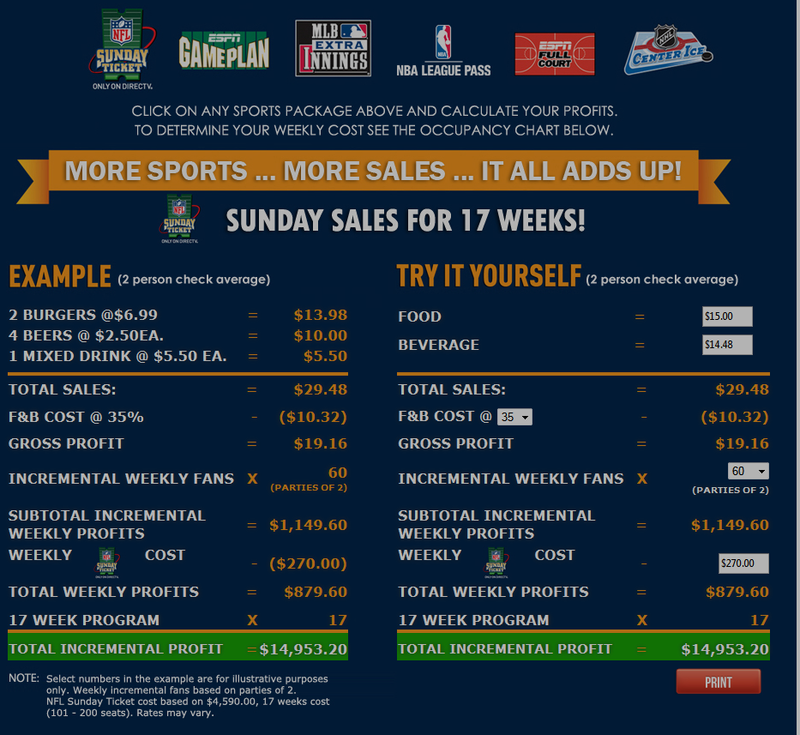 You simply login to the DIRECTV MVP Marketing website, choose the sports package you would like to calculate profits for and then enter your average sales for each of those sports, your F&B costs and the number of new fans and the calculator will show you how much profit you can expect to make over the number of weeks that package runs. In this example for a bar or restaurant that seats a total of 101-200 and brings in just 60 new customers per week to watch the games on Sunday, the profit over a 17 week NFL season is a whopping $14,953. While the DIRECTV profit calculator for NFL Sunday Ticket and the other DIRECTV sports packages does give you an example of what you can make, it is by no means a promise of future profits. Some of our customers have made considerably more than what the estimate from the profit calculator because the fans they attracted with the sports packages stayed longer than their average customer and ordered more food and drinks. Call us today at 505-296-9423 or 800-951-1979 and we will sit down with you and help you determine what type of profit NFL Sunday Ticket and other DIRECTV sports packages can help you generate. Part of each Sports Package on DIRECTV is a marketing program and free and deeply discounted marketing materials as part of the DIRECTV MVP Marketing Program. 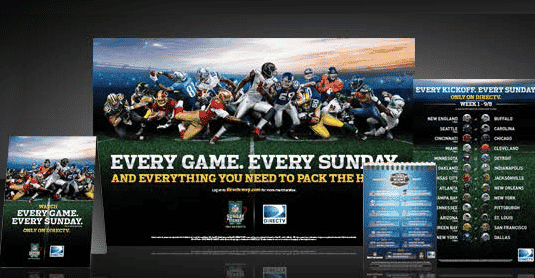 For example, with the NFL Sunday Ticket package you receive a marketing kit that includes a banner, a sidewalk talker, posters, coasters and much more to help you draw in new customers and inform your customers about upcoming games. You can also purchase additional marketing materials with the credits you get with each sports package and for deeply discounted prices if you have already used your credits.